Location: Gold Crown Pool Center, 111-113 Budafoki Str., Budapest 1117, Hungary. The sun has only just risen over the horizon but the members of the First Hungarian Pinball Federation have already been setting up their machines. All around the country they had put their precious pinball machines onto lorries and sent them to Budapest in order to join forces and create one big amusement arcade. 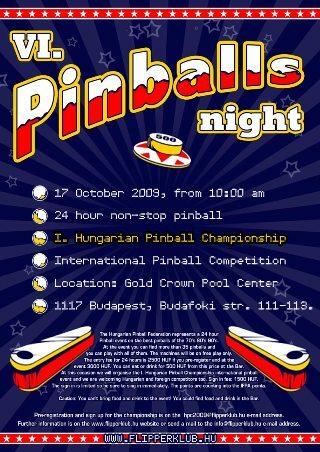 The 6th Hungarian Night of Pinballs is about to begin in less than 24 hours. Physically tiring, but it's not work! The lorries keep arriving with the pinball machines on board. The first pins are set up before 8 o’clock in the morning but the last ones are not finished until after 10 o’clock that evening. Some team members are busy helping to assemble them while others are already playing with the pinball machines which have been set up. It is all in perfect harmony; everything is put in its place, exactly where it had previously been planned to put it. The studio is also being set up since the whole event can also be followed live on the internet. By the end, everything is set up for a 24-hour pinball marathon starting the next morning at 10 o’clock. There is a long queue at the entrance at opening time at which time each participant is given an arm band and some tokens which can be used at the snack bar. Pinball lovers quickly occupy all 53 pinball machines which were collected for this year’s event. One of them is a digital prototype, which is a huge success and is used continuously. During this time the organisational team for the first Hungarian Pinball Championship is very busy, registering the competitors and reserving 18 machines for the competition. At 11am, the first HPC (Hungarian Pinball Championship) can start with its 60 competitors. In the first round, 21 competitors qualify based on their performance. The first 3 will go straight into the final 12. The remaining 18 make 9 pairs and the ones who are worthy to qualify are selected by ‘sudden death’ matches. The qualifying rounds have been competitive but fair. The organisers have only had a few administrative jobs to attend to. In the next round, the top 3 qualifiers have to re-join the battle. The tension is getting greater and greater because whoever qualifies here can play in the semi final among the best six. Since there are several foreign competitors, winning through to the semi final on merit against an international field a very good result. Although there are several international competitors from Switzerland, Germany, Slovakia, Sweden and England too, only Hungarian players were able to qualify for the semi finals. The final of the national championship will be won by a Hungarian competitor. It is 6pm when the tournament room quietens down and the semi final begins. Six competitors play on two machines which are the same (Congo) to get into the final two. In order to achieve this they have to achieve the highest score on their specific pinball. In the tournament room silence is almost visible; everybody follows the event with rapt attention. Eventually the two favourites, Szalai Krisztián (SZK) and Solymosi Gábor (S.G) qualify for the final. The finalists have a few minutes to rest and to prepare both physically and mentally. The other players are excited and getting ready for another fight since they can expect a serious battle for third place. The competition is continued on a unique machine - the Safe Cracker - on which conventional pinball tricks cannot be applied. In the tournament room everybody follows the play-off very closely because now we can enjoy a game featuring some of the best players. The battle is full of excitement and twists and turns, but it is won by Barna Attila who secures third place. After a few minutes' break, the final of the first HPC begins. The prize is remarkable but the contestants know each other very well. In the fever of excitement only the Safe Cracker playing its music breaks through the tension, as the professional players accept the result with great professionalism when the last ball finally goes down. In the end, even though there is minimal difference in their scores, the final is won by Krisztián. Straight away Gábor Solymosi, who came second, congratulates the winner. There is a short announcement of results followed by the handing out the prizes and saying thanks to the sponsors as well. At the end of the competition it’s time to have fun. There are 53 machines for the pinball fanatics and freaks to play. The task is simple, all of the machines are set up with free play so everybody from the 300 participants is sure to find something he likes. The pins function well (apart from a few minor problems) thanks to the careful owners who spend time and money on repairing these machines, which are fortunately becoming so fashionable once again. The few repairs which had to be done on the spot were performed by the official serviceman of the federation, Master Sokol. Participants played around ten thousand games, which is a huge amount and equates to more than 30 plays per visitor. The whole event is evidently a huge success because at closing, after 24 hours of ‘pinball Babel’, some of the real freaks are still playing and must be asked to stop and leave. Unfortunately once all the excitement is over it is back to reality again. All the machines which have been transported here must now be taken away. The packing is fast and professional so by 2pm the rooms are totally empty, disguising that fact that a few hours earlier the biggest pinball event in Hungary was held here. However those who have been, leave with enough happy memories to hold on until the next event, the 7th. Hungarian Night of Pinball, starts.